Chewy Lemon Sugar Cookies are the ultimate chewy sugar cookie with a lemon twist. These are a perfect Springtime treat to welcome the season! While it may technically be spring, Minnesota temperatures remain chilly (think single digits, brr!) It is this time of year, the transition from winter to spring, that lemon desserts are wonderful. Berries are not quite in season, and lemon is like a bite of sunshine, all bright and cheery. Add lemon to the ultimate chewy sugar cookie, and it’s Springtime perfection in cookie form. For these Chewy Lemon Sugar Cookies, I started with everybody’s favorite Chewy Sugar Cookie recipe. I have made variations of this recipe in the past, and it makes such a great base recipe. I love the slight tang the cream cheese adds to this sugar cookie and the chewiness is hard to beat. So to make this lemon version, I simply added some lemon zest and juice and then crossed my fingers that it wouldn’t impact the consistency of the cookie. I dare say the lemon version is even better than the original! There is just the right amount of lemon flavor without overpowering, and the texture is also better, which I did not think was possible. Chewy Lemon Sugar Cookies truly are the ultimate chewy sugar cookie made better with a lemon twist! Place ⅓ cup sugar in a shallow bowl and set aside (this will be used for rolling). In a large bowl, mix 1½ cups sugar and lemon zest. Add cream cheese cubes. Pour butter over sugar and cream cheese and whisk to combine (some small lumps may remain). Whisk in oil until incorporated. Add egg, milk, lemon juice and vanilla; continue to whisk until smooth. Bake 1 tray at a time until edges are set and beginning to brown, about 8 to 10 minutes [Note: To ensure a chewy cookie, be sure not to over bake!]. Let cookies cool on cookie sheet for 5 minutes and then transfer to a wire rack to cool completely. 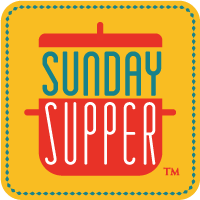 This week Sunday Supper is teaming up with Dixie Crystals to share Springtime Sweets. The group is sharing delicious recipes for goodies that use at least 1 teaspoon sugar. Easy enough! There is definitely a treat to please everyone this week, so be sure to check out all the tasty recipes! This post is sponsored by Dixie Crystals. All opinions are my own. Such wonderful looking cookies! They are perfect for spring. What a lovely sugar cookie twist. I bet these are amazing…my cookie loving girls will want to try these asap. I LOVE LOVE soft chewy cookies. Love the addition of lemon to these sugar cookies too!! I love, love big crackle topped cookies! And a lemon version sounds incredible!! Love lemon with cream cheese. These cookies look like chewy perfection! Nothing beats a good chewy cookie. Lemon is definitely one the first flavors I think of in the spring! These cookies look divine! I love a good chewy sugar cookie. I’m sure the lemon just adds a nice little zip. Love this spin on regular sugar cookies!!! so lovely!! I ADORE lemon desserts…and sugar cookies! I think I must make these soon!!! Perfect looking cookies! Lemon version sounds so good! When should I expect my package filled with these cookies to arrive? And so begins citrus season!!! These lemon cookies look fantastic!